Happy Monday! Thank you to everyone who participated in Green Week last week. It was a lot of fun to meet some new bloggers and of course to see everyone wearing my favorite color :) Even though it's no longer green week, I'm still wearing a green necklace. I know.... not surprising. I also threw in a little pink just like this outfit from last week when I learned that pink and green really do go together (who knew?!). Last week was spring break at the university I work at. That means the students were gone, gallivanting in Cabo, Seaside, Cancun and Vegas while I was hanging out at my desk, freezing my face off (why is it still cold outside?!). I miss having a spring break, I really do. I love thinking back to the trips I took while in college - I did the Florida thing one year, which was... memorable. P.S. Don't google "spring break" looking for a cool picture - you'll want to wash your eyes out with soap. Do you still have a spring break? If not, what was your best spring break trip in college? I'm a teacher, so yep, still have spring break. I needed it as much as the students did! This is such a cute look! Thanks for stopping by my blog! I miss having spring break so much! I think I miss having summer break, but I know that after two days of not having a schedule I start to go a little crazy. My senior year of college, two of my girlfriends and I went to San Francisco (from the East Coast) and stayed in a wonderful little hostel. We went hiking in Muir Woods, saw a friend who had left college and moved to SF to pursue a music career, went to a jazz club, went sailing, ate sushi, and so much more! Now that I have a job, a husband and a mortgage, it's much harder to find the time and money to take trips like that. I think if I had an institutionalized spring break it would be easier to see that I needed to take advantage of that time and pull the trigger on plane tickets! We already had our spring break which was more like a late winter break! We don't typically do anything fun, but 2 years ago I did meet my husband in Madrid for the week which was amazing! Love the pink and green together. I haven't been able to find an outfit that works with pink and green, but I might need to just add in the colors with accessories! I love this outfit and the lighting is gorgeous! I didn't do anything cool for Spring break in college. My family lived far away, so I always just went home to spend some time with them. Now I just try to avoid going on vacations around spring break time, because I don't want to deal with crazy college kids at the beach! Hahaha, this post cracked me up, especially the comment about the soap lol. You look so cute and all the photos are beautiful. I love that lace shirt and those boots as I have said before. love the green next to the cream! No spring break for me but I haven't died yet so there's still time. 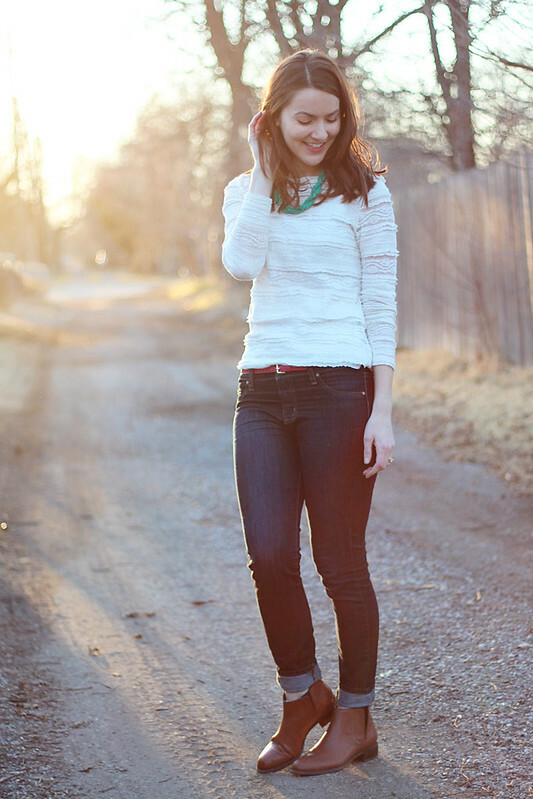 ;-) I love cuffed jeans with ankle boots. Cute look! that shirt is beautiful!... and i love the pop of green with the necklace. you look great! What a cute outfit! I really like the pop of color from the belt. :) Nope, no spring break for me but that's okay. As long as spring weather is headed my way, I will be happy. I need more sunshine in my life! I don't think I ever did the traditional spring break, with the exception of the one year I did study abroad and got to do some extra traveling. You also have the best necklace collection ever! 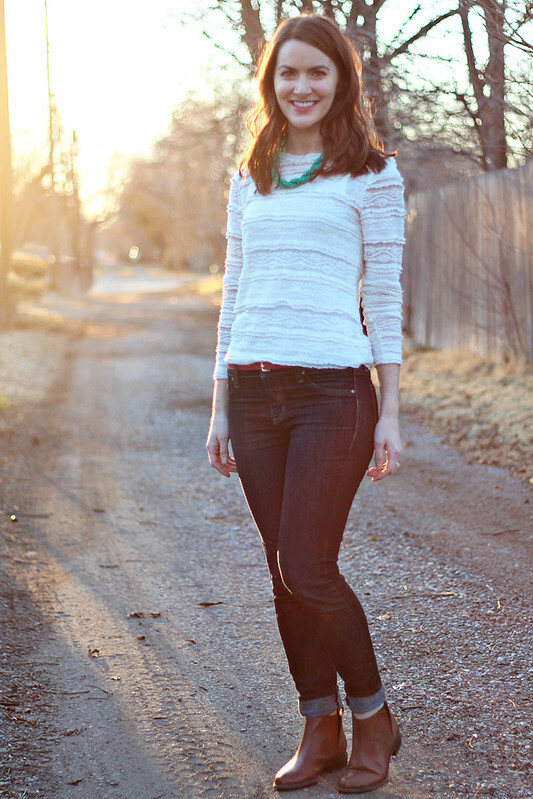 Such a pretty casual look, I love this blouse. I never went anywhere warm for spring break. Boo for the cold. Oh that stinks that you can't go anywhere on your spring break! I'm on my break right now, but I'm hanging around town now since I'm heading to AZ in May. I never did the college spring break thing (sadly), but I can only imagine the images that pop up upon Googling... Love how simple yet cute this outfit is! This is an adorable outfit! I love pink and green together =) And those boots look so cute and comfy! Such a cute outfit!! I love those boots. And all of it. Also, spring break is the best! They just recently made it a 2 week affair here, which makes me kind of sad that I'm not in school anymore haha. That necklace is so pretty!! I miss spring break. I could do a beach trip right about now! One of the things I miss so much about school is having a spring break...and a summer break. I know we all get vacation days, but there's something amazing about everyone all being off at the same time. I'm probably not the norm when I say, I worry when I take time off that things are going wrong without me at work. On another note, you look great in this outfit and I love the lighting in your photos. I know what you mean about not having a spring break. A cashier asked my boyfriend and I if we had plans for spring break. We're both not in school anymore and haven't been for a few years so it sad to say "just work." I never did a crazy spring break trip in college but your suggestions make me wish I had! 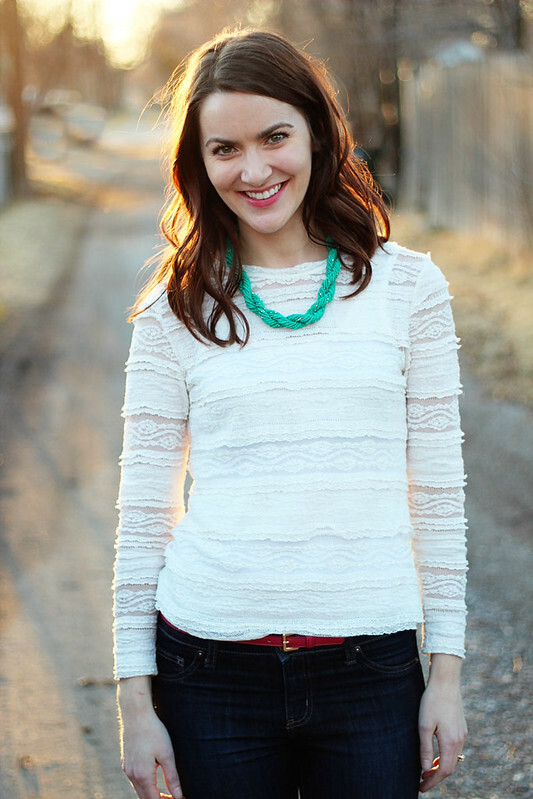 After seeing these photos I kinda feel like I need a green statement necklace... :) So pretty! That lovely green necklace is the perfect icing to an already lovely cake!!! I love that lace top on you! And you make the rolled up pants with booties look so good- I just got some booties and tried it...didn't look as good on me...I need to keep practicing evidently- ha! I love, love, LOVE this entire outfit!! It's styled perfectly. I am drooling over your shirt!! I love the details of it!! No more spring break for me sadly but my fiancé luckily stills gets it…he's a teacher! I JUST got off my last spring break. It completely flew by and made me sooooooo sad that I will basically never get a spring break again! This is a very beautiful look. I adore the lace and I love your necklace. I can definitely see why you continue to wear green. It’s a colour I’ve come to love a lot in more recent times. I love the pops of color you have going on here! This is a great way to subtly transition into spring. That lace top is too adorable! I was flying for work on the start of spring break travel, and it made me REALLY miss having spring break. Everyone was headed somewhere awesome for vacation, and I was headed home from a long and tiring work trip. Definitely not as fun! I wish I could pull off booties, yours look amazing. Ha! 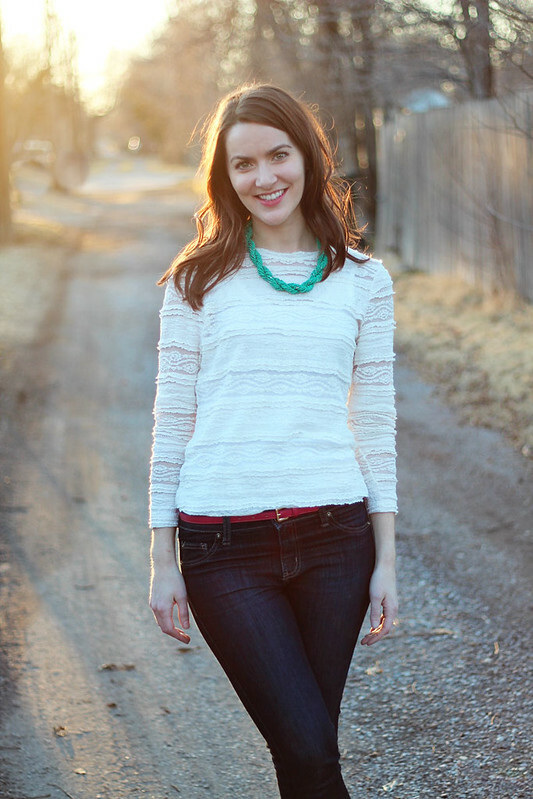 I just wore this top on my blog today. I love it so much. I like how you used a wider tank top under yours. I used a thinner strap, but I think yours looks better. I am also lovin' the rolled pants with the booties! Yay! There's that beautiful lace blouse again! I am so smitten with it! I think you look lovely in these photos as well - the lighting is so cool!